In a large bowl, sift together 2 and 1/4 cups all-purpose flour, 1 teaspoon baking soda, 1 and 1/2 teaspoons cornstarch, and 1/2 teaspoon salt. In another bowl, whisk together 3/4 cup packed brown sugar, 1/2 cup granulated sugar and 3/4 cup melted butter. Whisk until the sugars have dissolved into the butter. Add in the egg and egg yolk, and whisk. Then add in 1 tablespoon vanilla extract. Pour the wet ingredients into the dry. Use a large wooden spoon to combine the ingredients together. Fold in 1 cup milk chocolate chips. Place the dough in a large bowl, cover, and chill in the refrigerator for at least 3 hours. I chilled my dough overnight. When you’re ready to bake the cookies, pre-heat your oven to 325 degrees. Pull the dough out of the fridge and let it sit for about 10 minutes. Line baking sheets with parchment paper. The dough is going to be hard, and firm, and a little bit difficult to work with. 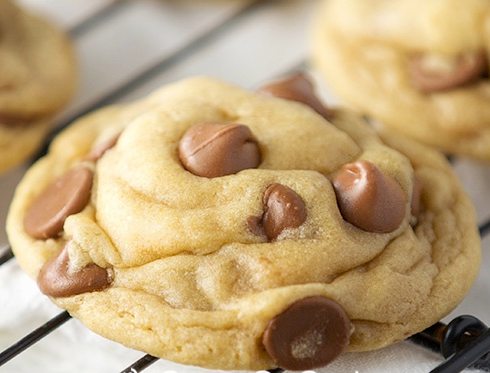 Use 3 tablespoons of dough for each cookie. Use your hands to form the dough into balls. Press a few additional chocolate chips onto the top of the dough ball. Give each cookie a good amount of space on the baking sheets. I was able to fit about 6 cookies per cookie sheet. Bake for 11-12 minutes. Do not overcook. They should look not quite done. Allow the cookies to cool for about 10 minutes before transferring them to wire cooling racks to finish cooling.